Suitable for computer rooms & domestic purpose. We offer Zeal Thermometer to our valuable clients. 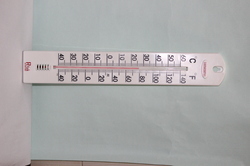 Glass Agencies EROSE are Manufacturer of Wall Thermometer. We are known as one of the most leading manufacturer and supplier of a very highly premium quality range of Wall Thermometer. Our range is available at market leading prices. Students not only learn how to measure temperature using Wall Thermometer but also get know the variations in temperature like inside the classrooms & in sunlight. In senior classes it is used to verify the conversions from Celsius to Fahrenheit & vice versa. We manufacture wall thermometer which are used in homes and allow to check temperature levels and set your heating and air conditioning systems for maximum comfort and efficiency. We are offering a wide range of Wall Thermometer, Zeal, UK to our customers. Wall Thermometers are available in two types wood body thermometer & plastic body thermometer. These Wall Thermometer are provided by us at very reasonable price. To measure the temperature of place in shade and in sunlight to compare them and verify the conversion formular for Celsius to Fahrenheit.